When you start a dog grooming business you can have flexible working hours, work from home, open your own pet grooming salon or choose to visit your clients at their home address (mobile). The options are open to your own choice, from home based, salon based or mobile – or any combination of them. Some companies supply a dog grooming business franchise, where you will be able to trade under a recognised brand name. An alternative to ‘starting from scratch’ is to purchase an existing grooming business and (if it needs it) further develop the business. Which ever route you decide to take, always check with the local council for licensing requirements, etc. and don’t overlook insurance cover. Whatever your chosen route to starting a grooming business, you will require training as a dog groomer to a professional standard. As a professional you will have the abilities to groom and correctly style the vast majority of dog breeds and your business will benefit from the image and results that you achieve. 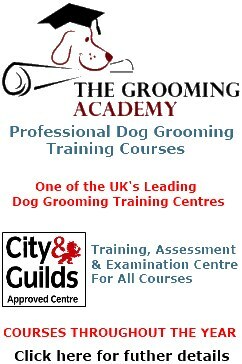 There are various dog grooming schools across the UK, each offering differing course content. Research the training facilities to be able to choose the grooming course that best suits your needs – if you’re unsure, give them a call and discuss your requirements and your plans, as content can often be adjusted to meet your needs. Try to find a course that includes advice on setting up and managing your grooming business. Prior to commencing your dog grooming training course (and while you are in training) you should work on a business plan for your dog grooming business. You will inevitably incur costs for the business start up, for training, insurance, premises, equipment, launch advertising, etc., so having a business plan will concentrate your mind on the outlay and will be of great assistance should you need finance. You should also bear in mind that you will have to complete some office and administration work each week as well - running your business is about more than just grooming dogs! Establishing your pricing can be difficult initially. Get it too low and the profitability will suffer, get it too high and you could lose potential clients. Until you are able to cost out the various aspects of your pet grooming business the easiest approach is to enquire about charges from other local groomers. This will give you an indication of what services are being provided locally and at what prices. At this time, you may wish to consider if your grooming business will be for dogs only or if you wish to include other pets as well – the only advice we would offer, in general terms, is don’t try to run before you have learned how to walk, you can always add further services at a later date should you wish to do so. When your business is up and running, you should make the time to stay ahead of the changes within your trade. As a professional dog groomer, you would be expected to know about changing styles, emerging breeds of 'designer dogs' and stay abreast of new equipment and facilities that are launched. Attend local dog shows, dog grooming trade seminars and exhibitions. Subscribe to the informative trade publications and spend some time occasionally looking through various internet sites, where you will find sites that exist to help with running your business, further training and listing numerous trade events. With the right approach, your business will grow steadily. Take a long-term view and don’t expect instant results from the morning that you open for business! If you give the best possible results consistently, then your reputation, and your business, will grow. Word of mouth is a great advantage – and your customers will be pleased to talk positively about your grooming salon when they have had good experiences. Remember that your dog grooming business is a business - not a hobby. However much you enjoy what you’re doing and are having fun, always take care of the business side too – and you should grow and prosper from this very enjoyable industry.